We invite you to the Main Library Building’s 10th Birthday. Join the staff and Friends of the Fargo Public Library in April and May as together we celebrate the success and achievements of the Fargo Public Library since our current Main Library building opened in April 2009. 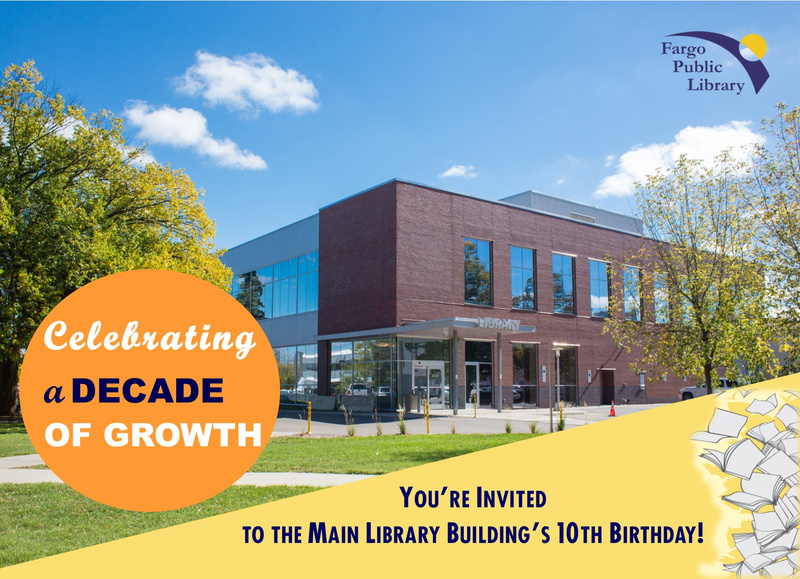 What first began as a dream in 2004 of a new and bigger library to meet the needs of a growing city took shape a decade ago; now we are celebrating how that dream has become a successful reality! ﻿Reception* from 4 to 7 p.m.
Short presentation by Fargo Mayor, Dr. Tim Mahoney, and Library Director, Tim Dirks, at 5 p.m.
Light refreshments and live music featuring the Dave Ferreira Trio. * This community celebration is sponsored by the Friends of the Fargo Public Library. International Day of the Book Celebration: "Don Quixote: What Makes the Modern Novel Modern?" Celebrate International Day of the Book with the presentation, "Don Quixote: What Makes the Modern Novel Modern? ", by Dr. Carlos Hawley from NDSU Department of Modern Languages. Hawley will describe how poetry, industry, and empire coalesced around author Miguel de Cervantes and gave rise to fiction, literacy, and the modern novel. This event is free and open to the public. Refreshments will be served. Contact Lori at 701.476.5977. This event is part of the Main Library Building's 10th Anniversary Celebration series of events. Tuesday, April 23 – Main Library at 7 p.m.
Test your knowledge of library and book-related trivia. Prizes will be awarded, and pizza will be served. Groups and individuals are welcome; pre-registration is required. Register online or call Amber at 701.241.1495 for details. Tuesday, April 30 – Main Library at 6:30 p.m. This event is part of the Main Library Building's 10th Anniversary Celebration series of events and is sponsored by the Friends of the Fargo Public Library. 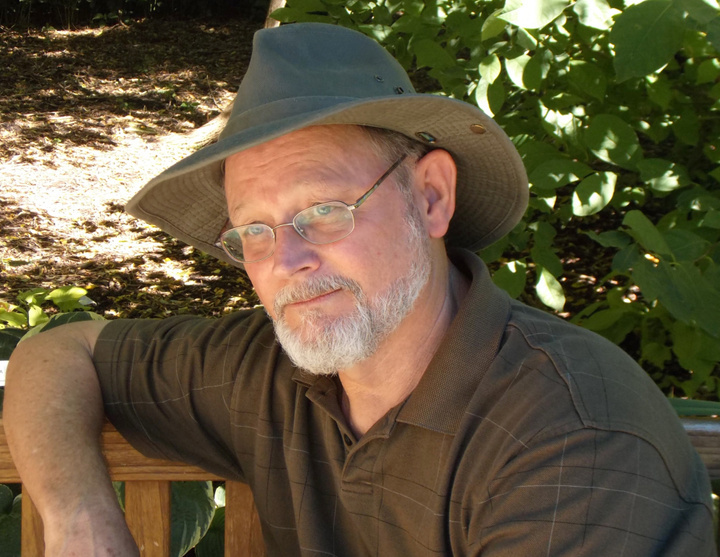 Join us for an author visit and discussion with William Kent Krueger, best-selling writer of the Cork O'Conner mystery series and also the novel Ordinary Grace. This event is free and open to the public. Books will be for sale and a book signing will follow this event. For details contact Lori at 701.476.5977. 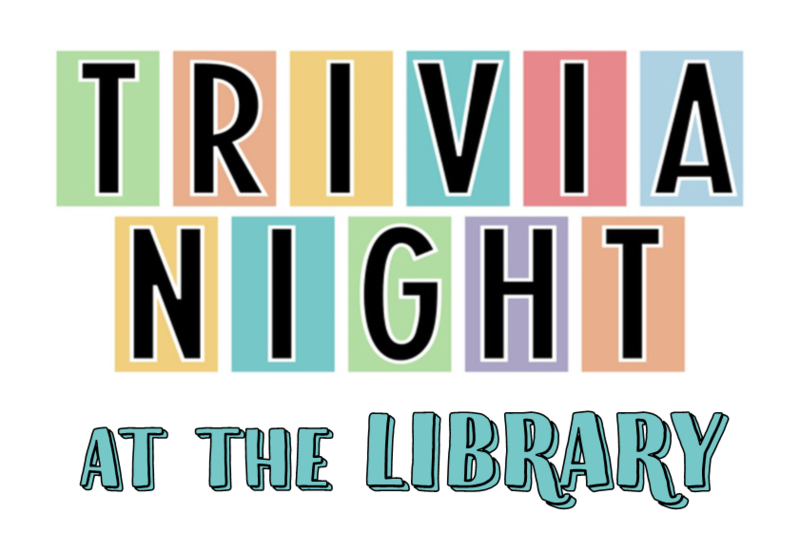 Monday, May 6 – Main Library at 7 p.m. Explore some of the many unique teas available. Samples of four different teas from around the globe will be provided each month, along with brewing tips and relevant information on the background of that month’s selection. 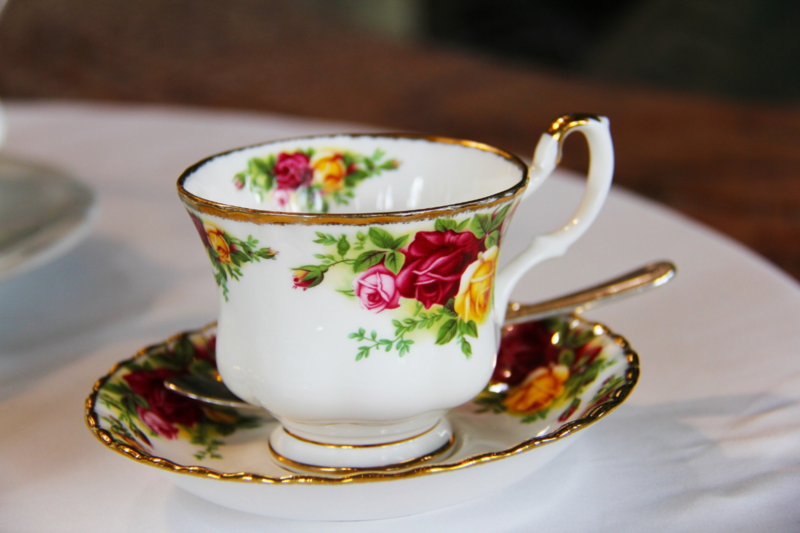 Bring a friend so you can sip tea and socialize. This event is recommended for adults. Pre-registration is required; register online or call the Main Library Information Desk at 701.241.1492. ​​Saturday, April 27 – Dr. James Carlson Library at 10 a.m. Try out a new game from the library’s board game collection or bring a favorite to play with family and friends. Join us for any of these family-friendly events where we will feature a new game each month as well as having a variety of games available for free play. No pre-registration is required. This event is open to children, teens, and adults of all ages. Call 701.241.1492 for more information. This is a class for those who haven’t tried yoga before or who want a refresher. The purpose of this class is to provide a relaxing environment to focus on taking card or YOU! Along with gentle stretching, this class will also teach breathing exercises to provide calmness. Bring a yoga mat if you have one or a large towel and wear comfortable clothing that is easy to move in. This program is recommended for adults, and no registration is required. Call 701.241.1492 for details. Go is a Chinese board game older than chess and arguably more sophisticated, while having very simple rules. Players alternate placing a small stone on a grid and attempt to control space on a board. The library is starting a Go Club and all ages and skill levels are invited to participate in the Fargo Public Library’s Go Club! Sessions are held every Wednesday between 7:30 and 8:30 p.m. in the Dawson Room at the downtown Main Library. No registration is required. Knowledge of the game is not required. Experienced players are also welcome. For details, contact Steve at 701.241.1492. All ages and skill levels are invited to participate in the Fargo Public Library’s Chess Club! Meetings are held every Thursday between 5:30 and 8:30 p.m. in the Fercho Room at the downtown Main Library. No registration is required. For more information, contact the Main Library Information Desk at 701.241.1492. Restorative Yoga is a 90-minute yoga class that has benefits to every person, regardless of age, gender, or physical ability. 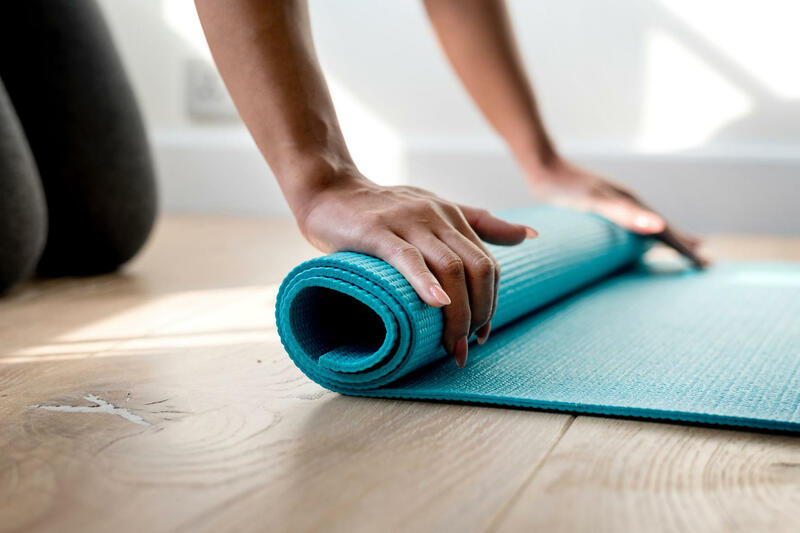 Some benefits to practicing restorative yoga include balancing the nervous system, deep relaxation of your physical body, boosting your immune system, and gentle stretching of muscles for increased flexibility. Props are used in this class for every pose to completely support your body and allow for full relaxation. Poses in this class are held longer to deepen the inward focus and to practice stillness. Bring a yoga mat if you have one or a large towel and wear comfortable clothing that is easy to move in. These classes are recommended for adults, and no registration is required. For more information, contact Lori W. at 701.476.5977.